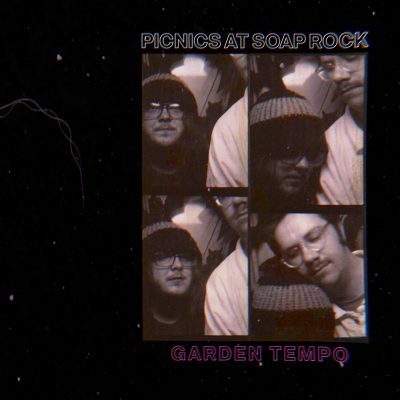 Garden Tempo is the debut EP from local band Picnics At Soap Rock. The duo, consisting of musicians who simply go by Ethan (drums) and Chazz (guitar/vocals), make music that calls back to the high point of lo-fi emo with enough rage and turmoil in their lyrics to justify the appropriation of this style. Far from wallowing in adolescent angst and pity, the high points of Garden Tempo offer abstract portraits of the complicated nature of mental health with some raucous, borderline psychedelic rock music behind them. At this point, anyone with access to a smartphone and enough patience can make what was considered a hi-fi record 50 years ago. The fuzzy, lo-fi quality of Garden Tempo is then a specific choice, one that gives the EP an anachronistic feeling. On “The Inside Of Your Wristwatch,” the blaring guitars melt into a wall of distortion, and the brittle cymbal lines are a perfect match for the strained, fading vocals. The screamed lyrics detail feelings of solitary anger and social disillusion before the narrator hits a talking deer—who might be the voice of Satan. The opener, “Waste,” displays a knack for marrying a lyrical message with musical backing, one of Picnics’ strongest traits, the final vocal delivers a call for increased faith in life. After dealing in depression, suicide and familiar strife, the assertion that “every weekend from now on is a celebration of what you didn’t waste” offers an empowering conclusion as the music launches into a grandiose instrumental coda. This does lead the title track, the sole instrumental cut, to feel a little lackluster. The slinking guitar lines don’t feel nearly as potent as the riffs elsewhere, and the lack of lyrics leave the track feeling unfinished.